Namibia is a vast, sparsely populated country with rewarding pockets of endemism in its enormous wilderness. By day enjoy the majestic rusty dunes of Sossusvlei and at night be enchanted by the desert sky. The vastness of Damaraland will astound you as will the desert-adapted wildlife. The last stop is Etosha National Park - famed for its large herds of game and great predator viewing to go with it. The camps are set within private concessions and you will be transferred by air seamlessly between destinations. Depart from Windhoek by air and enjoy awe-inspiring views of the mountains and the desert floor. Fly to Sossusvlei for two nights at Little Kulala. Afternoon desert activity and sundowners in the "perfect light". Each room at Little Kulala has a rooftop 'skybed' for romantic stargazing. Excursion to Sossusvlei and Sesriem Canyon. Optional hot air balloon excursion. 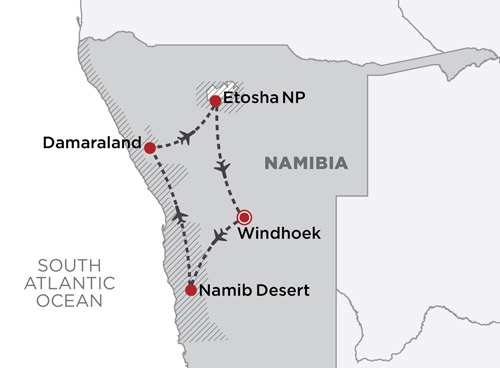 Fly to Damaraland - we enjoy a scenic flight over the Namib Desert for a different perspective of the "dune sea" - including the possibility of seeing shipwreck remains plus an old mining camp along the Skeleton Coast before heading inland to northern Damaraland. Spend two nights at Damaraland Camp. Damaraland Camp is famous for its diverse compliment of desert-adapted wildlife, especially elephant, and its highly successful partnership with the local Torra community. The fight reveals the considerable contrast of the stark and rocky scenery of Damaraland and the Kaokoveld and the richer woodland areas and grassy plains of wildlife-rich Ungava and Etosha. Stay for two nights at either Ongava Tented Camp or Ongava Lodge. Intimate Ongava Tented Camp is hidden in the west of the Reserve and overlooks a waterhole to which a plethora of wildlife congregate to drink. Ongava Lodge is scenically nestled around a rocky outcrop and overlooks the vast plains beyond plus a productive waterhole that is floodlit at night. Prices are based on a minimum of 2 people travelling together. We recommend if you have more time to add another night at any or each destination.